Storey Publishing, LLC, 9781580174886, 144pp. Pass the hammer to a new generation! 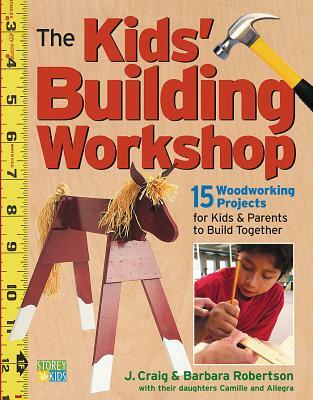 This kid-friendly guide covers the essentials of carpentry, including the proper way to drive a nail, the safe way to drill a hole, and the importance of measuring. You’ll be amazed at how fast your miniature carpenter acquires the skills to complete 15 projects that include game boards, play sets, lemonade stands, birdhouses, equine sawhorses, and more. Young crafters will be ready for the woodshop in no time. Barbara Robertson is Director of Education at Williams College Museum of Art and designer of Kidspace @ MASS MoCA. She lives in Williamstown, Massachusetts with her husband Craig. Craig Robertson has been a carpenter and contractor for 12 years. He lives in Williamstown, Massachusetts with his wife Barbara.